RBTH presents a selection of views from leading Russian media on international events, featuring reports on the continuing demonstrations in Armenia and a recalculated gas tariff for Ukraine, as well as analysis of the reasons European-Russian relations are likely to occupy a low profile at this week’s EU summit. The centrist Nezavisimaya Gazeta newspaper is following the protests in Armenia, which have now taken place not only in Yerevan, but also in the cities of Gyumri and Vanadzor. The newspaper reports that Armenian President Serzh Sargsyan has ordered to review a recent energy tariff hike that had seen electricity prices double and was also willing to meet with the protesters, even though they refused. "The demonstrators are not ready to talk about the budget, the investment risks and subsidies," said Rector of the Caucasus Institute Alexander Iskandaryan. "This is a decentralized networked protest, which speaks the language of ultimatums, not compromise. This protest does not have a central organizer or political leader. It is not backed by political parties. That is why various demands, from social to radical, can be heard during the demonstration." 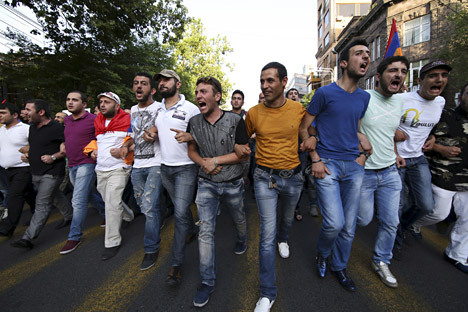 According to Iskandaryan, the political component of the protest consists in its target – the Armenian government. "This protest is not so much against the electricity distribution company as it is against the system, corruption and the increase in prices in general," explained Iskandaryan. The European flags waving in Yerevan demonstrate the attitude of the country’s EU-leaning youth, writes the newspaper. "The Europeans have not ruptured their relations with Armenia," remarked Stepan Grigoryan, director of the Analytical Center for Globalization and Regional Cooperation. "There was no talk of 'either the EU or the EEU [Eurasian Economic Union – RBTH].' Brussels is offering Yerevan cooperation in spheres that remain open after Armenia's entrance in the EEU." The business magazine Expert reports that Russian President Vladimir Putin has ordered the government to recalculate the cost of gas destined for Ukraine. In his view, in the context of the decline in oil prices, Russia cannot afford to give its neighbors big discounts, which is why Ukraine must now pay for fuel at the same tariff that Poland pays. On June 25 Russian Energy Minister Alexander Novak announced that so far the Ukrainian government has not asked to extend the discount to the second half of 2015. According to Oleg Shagov, director of the analytical department at investment company Solid, if Russia does not extend the current discounts for Ukraine, it will cost Kiev an additional $300 million. Trilateral gas consultations between Russia, Ukraine and the EU are planned for the end of June and will probably continue into July, notes Expert. They will cover the volumes of Russian gas that must be pumped into Ukraine's underground storage tanks by the middle of October. "Theoretically, the EU, which is afraid of freezing during the winter without Russian gas, can find a way to help Ukraine make the payment," said Shagov. "Russia is also capable of making some concessions, either by giving Kiev some kind of discount or accepting the payment in installments." The business daily Kommersant reports that for the first time since the beginning of the Ukrainian crisis relations with Russia and the situation in Ukraine have not been placed on the official agenda of a summit between European leaders, who have decided to concentrate on internal problems at the meeting that begins on June 25. Kommersant explains that the EU leaders' decision in March to tie the extension of sanctions against Russia to the realization of the Minsk agreements on the resolution of the conflict in eastern Ukraine was confirmed by the formal accord of the EU Committee of Permanent Representatives and stipulated as a document during the EU foreign ministers' meeting on June 23. As a result, the package of economic sanctions against Russia was extended by another half year and the restrictive measures against Crimea and Sevastopol by a year. "This is a bad sign," said a Kommersant source within the EU structures. "It is a sign saying that the crisis in Ukraine and in Russian-European relations has turned into something habitual and is perceived as a status quo, which means that we are moving towards the freezing of the conflict, as it happened in Pridnestrovie [in Moldova], Abkhazia and Ossetia [breakaway regions of Georgia – RBTH]." Moreover, Kommersant sources in the EU also say that the necessity to solve another crisis, the bloc’s internal migration crisis, has also played a role in removing Russia from the EU's current agenda. The fight against the influx of illegal migrants – mostly refugees from North Africa and the Middle East – will be the main issue during the EU summit.